When I first came across this old house in the Seattle real estate listings, it didn’t shout Craftsman to me, but according to the listing it’s just that. I do wonder if the second story was added on later or at least expanded. It was built in 1910 and I’d love to see how it looked then, both inside and out. Stunning corner lot Craftsman that has been beautifully restored. There are large windows throughout that flood the house with light. The main floor has high ceilings, formal dining room and kitchen with darling eating nook that looks out to the tranquil landscaped yard. Upstairs features a spacious and bright master suite with an elegant bathroom with large soaking tub and heated floor. Love all the woodwork and the fireplace in the dining room. The house must have been a lot darker and more traditional looking before everything was painted white. Would love to see the before photos! The patterned wallpaper in this dining room didn’t photograph very well–probably looks better in person. The house has 3 bedrooms, 2 baths, and a little over 2,000 square feet. Gorgeous home!!!!!!!!! I am one of those people that craftsman purists would be really ticked off at . I love the wood pained white!!!! Thanks for sharing. This is fabulous! LOL at your comment about the painted woodwork, but it looks so wonderful. Making the wood light lifts the interior into a home for today and allows for so many other colorful options. Great find! Beautiful! Love the kitchen and all the floors. Looks like a true lived in house. I really like the house, but the colors, the painted woodwork, and the furnishings are not to my taste at all! It looks a little cold for the Pacific NW, but I DO love the pink sofa by the window! I loved that too! I just wanna curl up there and read a book or spend the entire day on my laptop. I agree – the proportions just don’t seem to fit somehow. Or maybe it’s the exterior paint colors that make it look odd? Craftsman style would have the two levels different colors. A darker color on top and lighter on the bottom might even things out at least to the eye. Other the the porch overhang it doesn’t look Craftsmen to me, it almost looks more Craftsment/Four Square. I’m a sucker for a breakfast nook and white kitchen, so I do like that. From the price, it doesn’t appear that this area of the country has taken a big price hit in the real estate market, at least not like the midwest. I happy for that. I love your real estate listings! I love the interior of this home so much! I like each fabric, wallpaper, light fixture, carpet and furniture choice. The back yard is also adorable – quaint and tasteful. I often wish each home for sale would include a floor plan… layout is so important. I think the ceiling light fixture in the brown bedroom is from the HGTV dream home master bedroom a year or two ago and I always wanted to know where to find that! I love this home!the kitchen is fabulous and the style is certainly in keepingwith the period of the house. The painted woodbrightens up the space. Gorgeous! I like the woodwork painted white. Lovely home thanks for sharing. I love the house. I’m not a big fan of the kitchen, breakfast nook and wallpaper though. Love the house. The soapstone counters and the butcher block island are very nice. Note the Nutone exhaust fan above the sink! Is this something that’s normal for all craftsman? You’re right! Good eye, Jordan. Beautiful Yard. Awesome Kitchen. The erst of the house would be a deal breaker for me. The light in the diningroom looks contemporary, etc, etc. I like a certain amount of white; but not in a craftsman home. They ruined it by painting all of the woodwork, etc white. Also depreciated it if somone (like me) is looking for a turn key Craftsman Home. Looks more like a four square to me. Fun post today! I agree with a lot of the comments… I normally LOVE white, but in this case I think they kind of ruined some of the original charm/woodwork by painting it. Oh well. I thought you’d like to see the following link to the assessor’s records. This doesn’t show any interior photos, but it does show an exterior photo of the house from way back when! Wow – so cool that you found that! I like the siding and window trim much better now! Love that you tracked that down for us! It looks so much better now. You can see they did a ton of work on it. Thanks, Heather! If you click on the little camera icon above the picture of the house, it shows you an additional view in color dated 1999. The first picture is considerably older, judging from the car sitting outside! The sale price took a hit this time it seems – in 2007, it sold for $785,000? That’s about $119,000 or so difference. Not a fan of ALL the woodwork being painted white, but it surely does brighten things up a lot! Still, natural woodwork, well cared for, is more beautiful in my eyes. This house is nice. I love craftsmans. There are a few things I don’t like, though. I don’t care for the wallpaper or that white entry. The white woodwork doesn’t bother me, but I do like natural dark woodwork better. If I could, I would scrape off the white paint and restore the natural color. I’ve actually seen several different homes around Seattle and Everett that look like this one, but I have no idea where they are located. I love that black and yellow dining room. I love the whole house. I really like this updated version of this home. It looks so clean and fresh and the decor is a hit with me. I agree with Lisa Pellegrini: Show us some floorplans in your listings so I don’t have to try to figure them out myself. Drives me nuts! It is too white for me, I would much prefer the original woodwork. True, the white is bright, but it is also cold. The natural woodwork would be much more warm and comfy, in my opinion. I agree, the style looks more American Foursquare to me, or a combination of Craftsman and American Foursquare. Also, I would like an accent color on the exterior. I’m with Marymg. It would have been so much cozier in the original wood tones. There was a period of time in which Craftsman homes were painted white, mid-20s I think, but it doesn’t seem appropriate for this house. Looks like more of a four square with some craftsman touches. And there is a special place in the seventh ring of purgatory (near the ghost of a 1922 paint factory) for people that paint wood work and mahogany furniture. I love the updated look. My daughter/blog partner also lives in an updated craftsman with painted woodwork. It is bright and cheery and says a young family lives here. They did a wonderful job on up dating. Love the dinning room. There is NO excuse for anyone to buy a Craftsman, a bungalow, or any variation of an Arts and Crafts home and then paint all the woodwork and built-ins white. Historic pieces of property should be restored as they were meant to be (while making allowances for modernizing certain features that need to be done). Personal preferences DO NOT MATTER. Buy a different home. Build a different home. Paint it whatever color you prefer. Just leave the historic details to those who can best appreciate them. A lot of us purists aren’t just cringing anymore . . . we’re really sick of everything being ‘whitewashed’. And, no, we aren’t against white woodwork, ever. Just NOT in these homes that were meant to showcase the beautiful, often fir, trim. It is NO different than putting a modern facade on an old home (a.k.a. a bad remodel), or a faux old facade on an obviously mid-century modern. Just because this doesn’t look as jarring doesn’t make it any more okay. Amen, sister!!! You said it all and I heartily agree! I hope someone with better taste buys it, strips the woodwork and puts in more appropriate furnishings. I do like the kitchen, but again, wonder what beautiful wood in hiding under that glossy white paint. P.S. And I am not a hater of white woodwork at all. In fact, I love it in many houses. But I think you should work with your house, not against it. There is no universal “updating” formula that will work with every house. There’s a craftsman styled foursquare in our neighborhood (right next door to my parents old house, in fact) that has that exact same entry set up with the landing and the small window (though theirs looks onto the side yard), so I think the second floor is probably original. I would have to say that I far prefer the original woodwork, but if it’s been painted in the past, stripping is 1) a royal pain in the youknowhere and 2) still doesn’t get you back to the shellac patina. Luckily, my little bungalow (which would fit into their downstairs with room to spare) was left unassulted by paintbrushes! Don’t love the “Domino” decor; I loved the magazine’s style, but it’s really not appropriate to every dwelling – in this case, I’d totally go ‘period appropriate’ and bring some nice rich woods and angular A&C styling back into the house. All the light fixtures need to be replaced with ones that fits the house better. I have a special hatred for the one in the living room – looks like a squashed Sputnick. Ick. Okay, so here’s the thing I must tell all of you who are so indignant about the woodwork in this house being painted white. Have you ever lived in the Northwest? I have. It’s rainy, overcast and gloomy for almost 9 months out of every year. I lived in Oregon for 10 years and it drove me to paint all my walls and ceilings bright white. No, I did not paint over a Craftsman style home but I WOULD have just to make my space brighter! I too lived in Seattle and it is so dark the majority of the year interior lights are on all day. I initially wanted to paint my walls but left them white on purpose which is saying a lot because I hate white walls. I cannot imagine living there with lots of dark wood everywhere. I think what they did was smart for the area. I live in a sunny clime now and no white here! I’m not a fan of the updated look here and have mixed feelings, although I’m not a purist or opposed to painting some woodwork white either. Why paint the walls dark–brown and gray or navy (can’t tell here) and then all the woodwork white. If you lived in a gloomy, overcast part of the country why not keep the walls a lighter color instead. Sometimes white is okay, but I get very tired of seeing it always used in updates. This is a long-time trend. I realize trends come and go, but white often lacks the warmth and beauty of wood. Dark woodwork can be oppressive too, but white can feel cold, glaring and lack warmth. 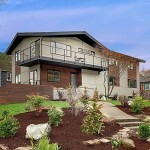 First: Yes, Craftsman houses could be built as two stories. Our town has many examples, as well as Victorian/Craftsman hybrids. I also live in Kansas where Prairie style can also be thrown in for good measure. Second: Real Craftsman purists will know that not all Craftsman houses were built with beautiful oak. Many of the Sears Craftsman houses utilized pine and that was ALWAYS painted. I have owned two Craftsman bungalows. One with all stained Oak, one with white painted pine…both totally original. One more thing. Craftsman colors were generally dark. My Stained oak woodwork craftsman had original chocolate brown walls in the living room and parlor. And pink walls in the dining room and kitchen. The dining room also had purple grapes painted as a frieze around the top. Sherwin Williams has historic paint colors for Craftsman if you would be interested in checking them out. Yes, I do cringe when people slap on paint on beautiful patinated woodwork that is the shining glory of the home. Take that away and what do you have? A cookie cutter looking style. Carefully crafted with beautiful wood was/is the decoration for these homes.